In every order from Ground Up we include stickers for you to use on your Chevelle, Camaro, Nova, El Camino, or anywhere you’d like! So, let’s see them in action! The more creative your photo, the more likely you are to win a free Ground Up Hat! 1. Take a photo: of Ground Up sticker(s) in action. 2. Post your image: to Instagram or Twitter using the hashtag #grounduptagandwin. 4. New order, New chance to win: You’ll get new sticker sheet in every box to try your luck again. Entering to win is as easy as placing an order. Ground Up Stickers are included in every order. Once your order arrives, put those stickers on your car, tool chest, or anything you want. Post your picture(s) to Twitter or Instagram with the Hashtag #grounduptagandwin and we’ll choose our favorite to win every month. 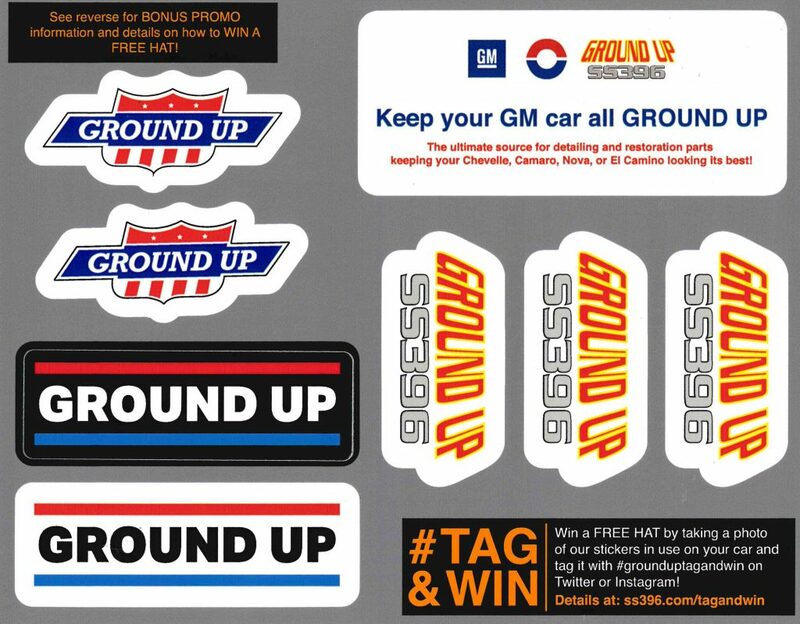 Submissions that use Ground Up stickers in their photo can qualify to win a free Ground Up Hat when they tag their image with #grounduptagandwin. Submissions are hand picked by the team at Ground Up at the end of each month. ELIGIBILITY: Sweepstakes is open to all legal residents of the United States and are at least 18 years of age or older as of the first day of each month where the sweepstakes are opened. Participation constitutes entrant’s agreement to and acceptance of these official rules. All federal, state, and local laws and regulations apply. Void where prohibited by law. HOW TO ENTER: During the Sweepstakes Period, eligible participants will be invited to use their personal social media accounts on Instagram or Twitter to post photos of themselves and/or their cars and/or their motor vehicle gear. Submissions to Instagram or Twitter must use the hashtag “#grounduptagandwin” to be considered as a valid entry. Of the valid entries, only photos that include BOTH a Ground Up sticker (of any kind) AND a car, driver, or vehicle gear will be considered to win. DETERMINING THE WINNER: One winner will be selected the week following the close of each month. Winners will be picked from all eligible entries received before 11:59 PM “ET” on the last day of each month by the staff at Ground Up. The winners chosen will be contacted directly and displayed on this page within one week after the close of each month. PRIZE: Each month, up to four winners will be selected. Ground Up reserves the right to pick 0 winners if no eligible submissions are posted to #grounduptagandwin OR if all eligible submissions lack quality, creativity, or common sense. Winner(s) will be chosen based on the creative use of Ground Up stickers in their submission and will receive a FREE Ground Up Hat, which will be shipped out durning the first week of the month ending the sweepstake period.